When it comes to earning money through blog or website, The Best monetization method I can think of is Google AdSense. The main reason for that is, Google AdSense is one of the highest paying ad network and is the most Trusted ad network. About 2 weeks ago I was Shocked to receive an email from AdSense team saying "Google AdSense Ad Serving has been Disabled to Your Site" Below is the Email I got from Google. This email is to alert you that one of your websites is not currently in compliance with our AdSense program policies and as a result, ad serving has been disabled to your website. 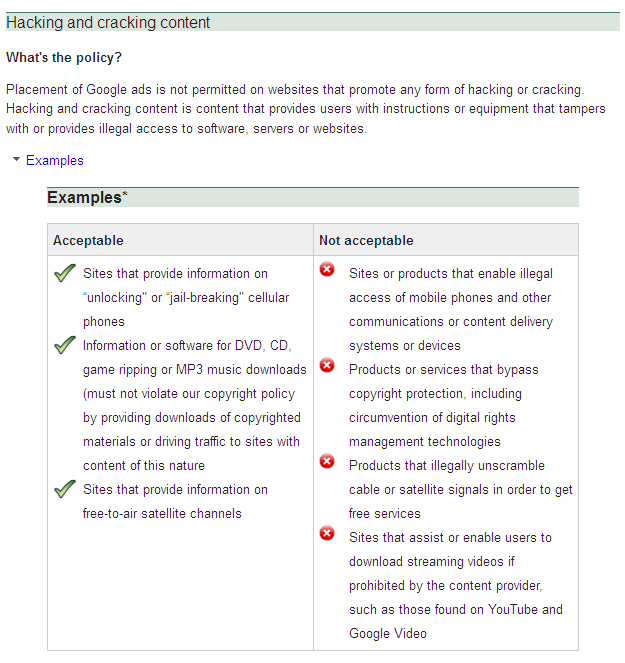 As stated in our program policies, AdSense publishers are not permitted to place Google ads on sites with content related to hacking or cracking. For example, sites showing ads may not provide instructions or equipment to illegally access or tamper with software, servers, or websites. While ad serving has been disabled to the above site, your AdSense account remains active. Please be aware that the URL above is just an example and that the same violations may exist on other pages of this website or other sites you own. Therefore, we suggest that you take the time to review the rest of your sites to ensure that they’re in compliance with our policies, and to monitor your sites accordingly to reduce the likelihood of future policy emails from us. Additionally, please note that our team reserves the right to disable accounts at any time if we continue to see violations occurring. If you wish to appeal this disabling then you can do so by using the Issue ID listed above to contact us via our Help Center: https://support.google.com/adsense/bin/answer.py?hl=en&answer=113061. According to this email, The AdSense team disabled Ad Serving on my website because of violations related to Hacking or Cracking. How I Fixed this Issue. After receiving the above email, I was very much upset and for once I thought that 'I won't be able to get back my Adsense account'. Google Adsense is the major monetization method for my website and is one of the major source of income from my website. 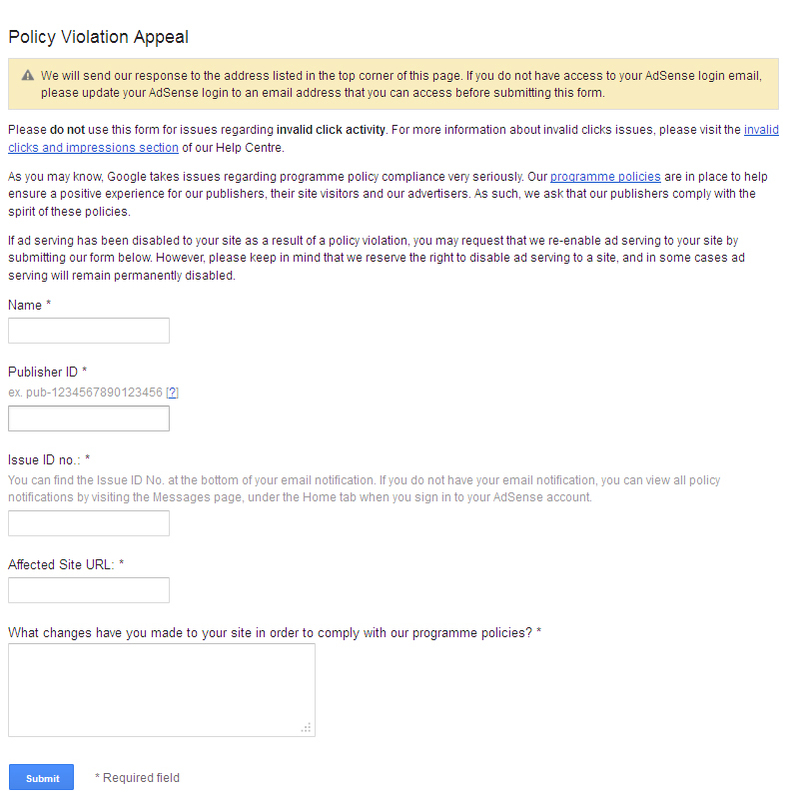 I always tried my best following Adsense policies then what caused google disable ad serving to my site? It was time to think. First of All, I reviewed my website and removed all the content which seemed to be violated. I removed the example post which was mentioned in the email by AdSense team. After a quick look through my website I thought everything is fine, I appealed Adsense team for Review. After about 3-4 days, I got another email from Adsense team saying that my site is still under violation and the ad serving can't be enabled. They advised me to again go through the website and fix the issue and they re-appeal. This was another shocking email for me. I did a little Research on the issue and after hours of non-stop Googling I came across a page which helped me a lot. This page contains examples of Adsense violations. Here is the page for you guys to refer. After knowing 'What is acceptable' and 'What is not acceptable'. I went through each and every page of my website and removed unacceptable things. With Research I came to know that Linking to websites which violate adsense terms also causes violation. Then I went through most of the comments on my website and Deleted comments which linked to websites containing hacking stuff, This time I went through my website completely and removed all violated things. Another thing I found on my website was a Full version Serial key of a Software, This was another violation under hacking cracking. I immediately removed the serial key and made sure that nothing like this is present on my site. Links to websites not complying with Adsense or containing Adult content. All comments containing links to websites with unacceptable stuff. Removed Full version serial key(s) and violated articles. My Second Appeal to AdSense Team. Now I was satisfied with my job and I was sure that my website is complying with Adsense. I took me another 4 days to do all this stuff and I had given my best. I appealed google to re-enable ad serving on my website, This was my second appeal. I messaged the using this page, In that message I explained Steps which i took to make my website comply with Adsense policies, I requested them to re-enable ad serving and I also assured them that this won't happen in future and I'll try my best to keep my website complying with their polices. Here is the exact message I sent to AdSense team. I’m an Adsense publisher from about an year now and it has been one of the main monetization method for my blog. I make sure that I follow all the quality guidelines and best practices mentioned for Adsense. Couple of days back, I got an Email stating one of my content is violating Adsense Terms, and I removed the content immediately. But after few days I got another message stating that my blog is still under violation. This is my second appeal, I've removed all the articles which i suspected to be in violation and I also removed comments which were linking to some other websites. I also found that there were some unauthorised serial keys on one of my blog article and I immediately removed them. I tried my best to make my website in compliance with Adsense terms and I'm sure that i've succeded in it. I also assure you that this won't happen again in future. Please re-review my blog and re-enable Ad serving. Thank you for making the requested changes to your site in order to comply with our policies. After thoroughly reviewing the-area51.com, we have now re-enabled ad serving to this site. Because ad serving to your site was temporarily disabled, you many notice a delay of up to 48 hours or more before ads begin appearing on your site again. We appreciate your patience and cooperation. I was really very happy to see Adsense ads running back on my website. I thank Adsense team for this. What to do If Ad serving has been Disabled for Your site. Now that I've gone through my story let's see What to do if this ever happens to your site. Here are some things which i learned from my experience throughout this hassle. First of all, Read the Email carefully, especially the Violations Part. Edit the Example post given in email, review it and make necessary changes. I recommend removing example post, but if the post is really important then editing is OK.
Go through your website and make necessary changes. Delete violated posts. Remove Links to websites not complying with Adsense. Add No Follow tag to most of outgoing links. I recommend adding No Follow tag to all outgoing links. Review Comments on your website, remove comments linking to other websites. Remove links to Torrent sites, Streaming video sites, file sharing sites. Make comment moderation compulsory. Remove Spam comments. If your site contains 'Serial keys', 'cracks', 'keygens' or Pirated softwares, Remove them. Try not to use Copyrighted stuff without permission, Remove such things. These are some simple tips which will really help you to re-enable ad serving. Try to implement them on your website, Once you're done Before appealing to Adsense team, Have a complete look at your site, Go through every page and link on your site, This is important don't appeal in hurry, take some time and only appeal once you're fully satisfied. How to Appeal for Re-Enabling Adsense. You also need to explain what steps you have taken for your site to comply with the policies.Explain that you went through all contents on the site and removed any content that violated the policies. Once appeal is sent It will take about 3 to 4 days before you receive an answer (It may take more days if appeal is sent on weekends or holidays. 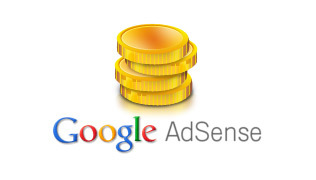 Adsense team may re-enabe ad serving to your site without sending any notification or email. Once you receive success message from Adsense team, It will take about 48 hours for Ads to start running on your site. If your appeal gets rejected, You may get a second chance to make changes to your website but everyone doesn't. So it is better to appeal when satisfied. So If you Implement these tips to your blog/website there is a higher chance of ad serving being re-enabled, but there is no guarantee. For Help Identifying Violated things, Go to this Page. I hope this post helps you guys, If you have any other queries or questions related to this issure, feel free to comment and ask, I'll Try to answer asap!